Health Secretary, Matt Hancock has vowed to invest £487 million on technology for the Health Service to make it one of the most advanced in the world, including introducing barcodes and mobile apps to track and monitor patients. Wristbands etched with barcodes will be used to track patients as they travel through different departments and wards within the hospital, while advanced mobile apps will monitor blood pressure and other vital signs at home, allowing patients to be diagnosed and discharged quicker. In plans laid out by Mr Hancock, £412 million will be made available to the NHS to update technology and improve patient care in hospitals, while a further £75 million will be available for health trusts to replace existing paper-based systems with electronic systems. Mobile apps are already being trialled at the Royal Marsden Hospital in London, where they are used to discharge patients faster and several trusts are already using barcodes to tack patient’s movements and current location within the hospital. 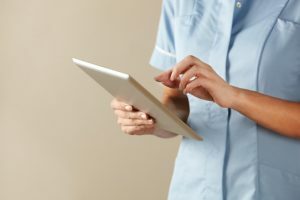 The Health Secretary believes that technology can not only play a huge part in reducing staff workload, but with ultimately improve patient care.